High density static mixer nozzles for use with 2.5ml, 5ml, 10ml, 50ml, 75ml, 200ml, 400ml, 600ml size twin cartridges as well as meter mixing machines. Nozzles dynamically blend the two individual materials (resin and hardender) into a single paste. Ensuring that epoxies, silicones, Polyurethanes and adhesives are correctly mixed. We stock mixers along with empty cartridge sets and a wide range of applicator guns. If using a pre-filled cartridge of adhesive, please check the attachment type to suit. Static mix nozzles for use with dual cartridges and metering mixing dispensing machines. High quality industrial grade plastics moulded silicone-free. Helical nozzles dynamically mix epoxies, resins, polyurethanes, silicones and potting compounds. 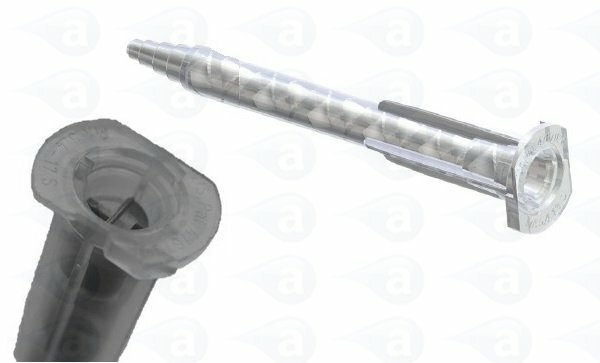 Available with bayonet, twist-cap, bell-mouth standard attachments. And in round or square body design. Select the mixer to suit the cartridge type and mix ratio or the machine. Nozzles to suit 1:1, 2:1, 4:1 or 10:1 mix ratios. Use with the application of epoxy resins, potting compounds, polyurethanes, silicones, sealants and other two-part materials. All products are supplied in sealed packs with labels and batch codes. 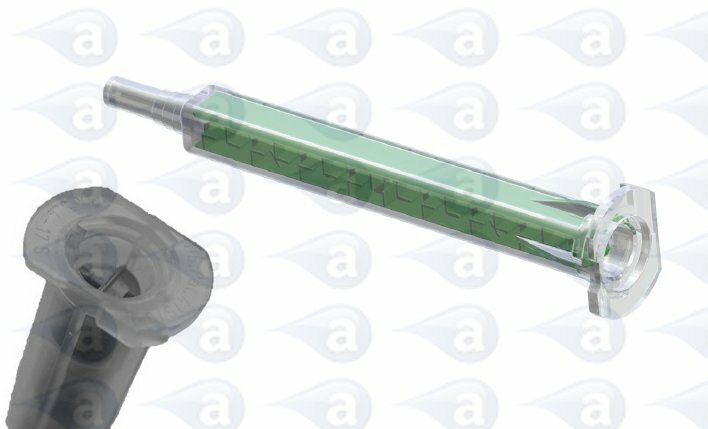 Bayonet inlet, helical static mixer for 50ml and 75ml dual cartridges. Stepped, tapered, straight or luer material outlet options. 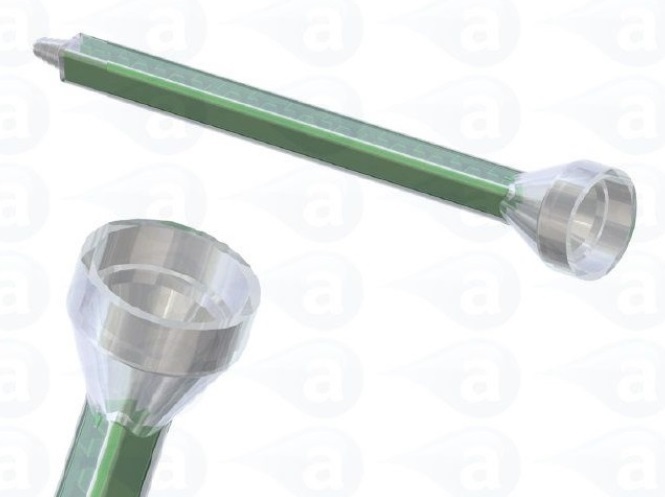 These mixer nozzles are suitable for all two-component materials from small dual cartridges. They are constructed of high grade polypropylene. All items are industrial grade safe and silicone free. Select MA mixers for 1:1/2:1 ratio cartridges (white elements) or MAHX below for 4:1/ 10:1 ratio cartridges (orange elements). Click product link for different pack sizes. Bayonet inlet, square bodied static mixer for 50ml and 75ml dual cartridges. Luer material outlet options. These mixer nozzles are suitable for all two-component materials from small sized dual cartridges. They are constructed of high grade polypropylene. All items are industrial grade safe and silicone free. 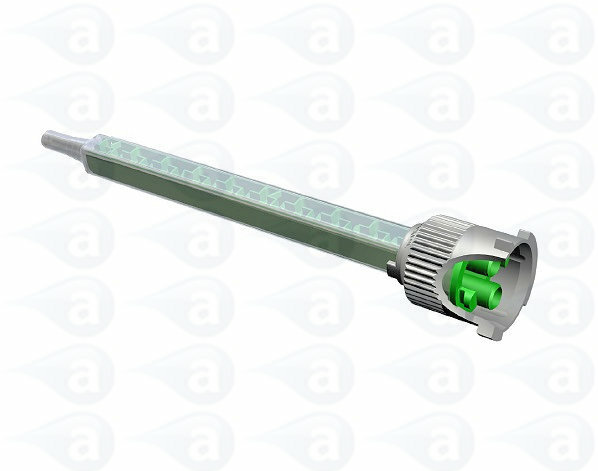 Select MAQ mixers for 1:1/2:1 ratio cartridges (green elements). Click product link for different pack sizes. 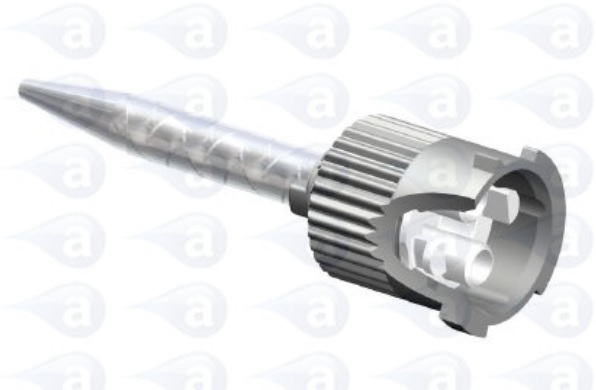 Grey cap dual hole inlet, helical static mixer for 50ml and 75ml dual cartridges. Stepped, tapered, straight or luer ends. These mixer nozzles are suitable for all two-component materials. They are constructed of high grade polypropylene. High quality mixer nozzles for use with twin cartridges. All items are industrial grade safe and silicone free. Select mixers for 1:1/2:1 ratio cartridges (white elements) or those for 4:1/ 10:1 ratio cartridges (orange elements). Click product link for different pack sizes. Grey cap dual hole inlet, square bodied static mixer for 50ml and 75ml dual cartridges. With luer ends. These mixer nozzles are suitable for all two-component materials. They are constructed of high grade polypropylene. High quality mixer nozzles for use with twin cartridges. All items are industrial grade safe and silicone free. Select MBQ nozzles with green elements for 1:1/2:1 ratio and MBQX with orange elements for 4:1/10:1 ratio (known as Quadro). Click product link for different pack sizes. Bell mouth inlet, helical static mixer for 200ml, 400ml and 600ml size C-System cartridges. Stepped outlet that can be cut back to increase orifice size and increase flow rates, straight end or luer tip. These mixer nozzles are suitable for all two-component materials. White elements for 1:1 and 2:1 ratio and orange elements for 4:1 and 10:1 ratio twin cartridges. They are constructed of high grade polypropylene. Bell mouth thread inlet, square bodied static mixer for 200ml, 400ml and 600ml size C-System cartridges. These mixer nozzles are suitable for all two-component materials. Green elements for 1:1 and 2:1 mix ratio cartridges. They are constructed of high grade polypropylene. High quality mixer nozzles for use with twin cartridges. 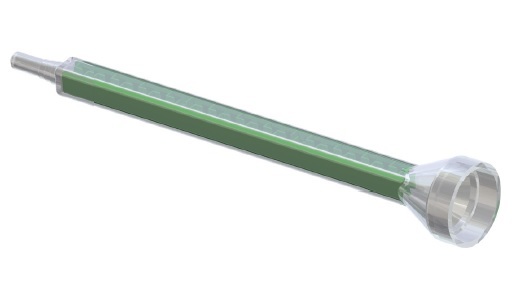 Screw thread inlet, square bodied static mixer for 200ml, 400ml and 600ml size C-System cartridges. Stepped outlet, open end or luer. These mixer nozzles are suitable for all two-component materials. Green elements for 1:1 and 2:1 ratio twin cartridges. They are constructed of high grade polypropylene. 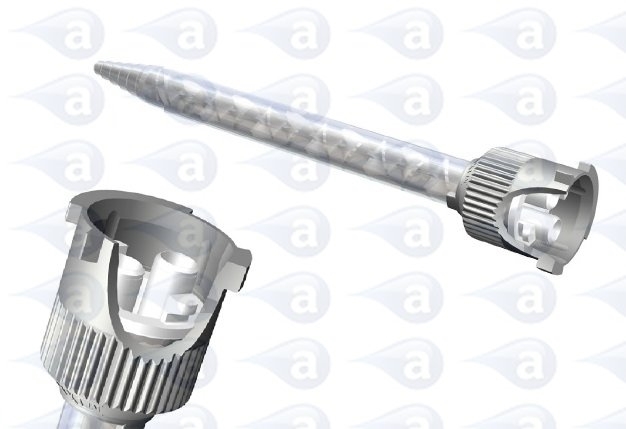 Grey cap dual hole inlet, helical static mixer for 200ml and 400ml dual cartridges. Stepped, tapered, straight, open or luer outlets. These mixer nozzles are suitable for all two-component materials. They are constructed of high grade polypropylene. High quality mixer nozzles for use with twin cartridges. All items are industrial grade safe and silicone free. Select mixers for 1:1/2:1 ratio cartridges (white elements) or those for 4:1/ 10:1 ratio cartridges (orange elements). 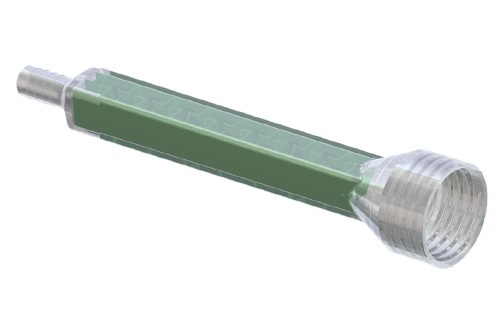 MFQ nozzles are square bodied with green elements and MFQX are square with orange elements (known as Quadro). Grey cap dual hole inlet, square bodied static mixer for 200ml and 400ml dual cartridges. Stepped or luer outlets. These mixer nozzles are suitable for two-component materials. They are constructed of high grade polypropylene. High quality mixer nozzles for use with twin cartridges. All items are industrial grade safe and silicone free. Select mixers for 1:1/2:1 ratio cartridges (green elements) or those for 4:1/ 10:1 ratio cartridges (orange elements). 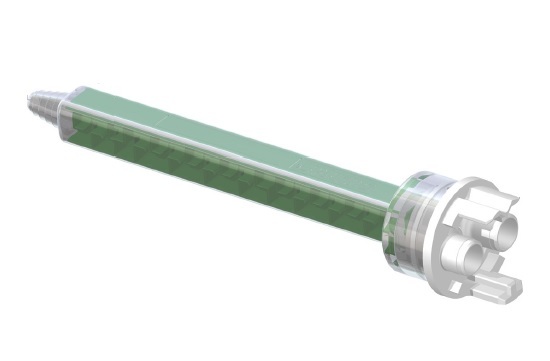 MFQ nozzles are square bodied with green elements for 1:1/2:1 ratio and MFQX are square with orange elements for 4:1/10:1 ratio (known as Quadro). Bell mouth inlet, helical static mixer for high pressure metering mixing and dispensing machines. Stepped, luer or threaded outlets. These mixer nozzles are suitable for all two-component materials and mix ratios. Yellow elements and a 16.7mm diameter top housing. 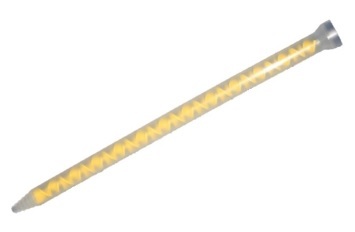 They are constructed of high grade polypropylene and are a round design. 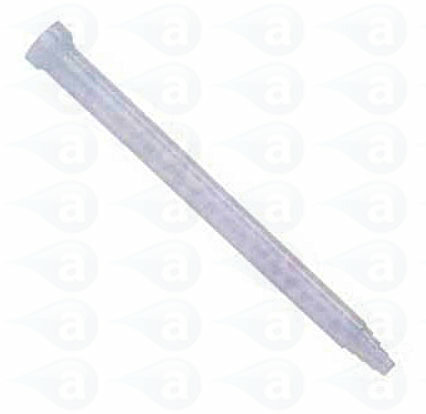 Recommended for use with metal safety shrouds when used on high pressure mixing and dispensing machines. Bell mouth inlet, helical static mixer for high pressure metering mixing and dispensing machines. Stepped, luer or threaded outlets. These mixer nozzles are suitable for all two-component materials and mix ratios. Blue elements and a 15.9mm diameter top housing. They are constructed of high grade polypropylene and are a round design. 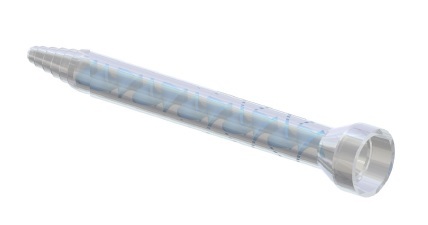 Recommended for use with metal safety shrouds when used on high pressure mixing and dispensing machines. 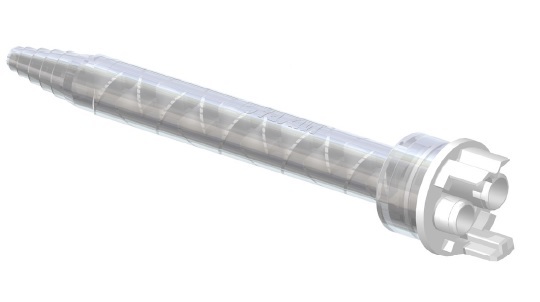 Grey cap dual hole inlet, helical static mixer for 2.5ml, 3ml, 5ml and 10ml dual syringes. Tapered and straight fluid outlets. These mixer nozzles are suitable for all two-component materials. They are constructed of high grade polypropylene. High quality mixer nozzles for use with twin cartridges. All items are industrial grade safe and silicone free. Select mixers for 1:1/2:1 ratio cartridges (white elements) or those for 4:1/ 10:1 ratio cartridges (orange elements).